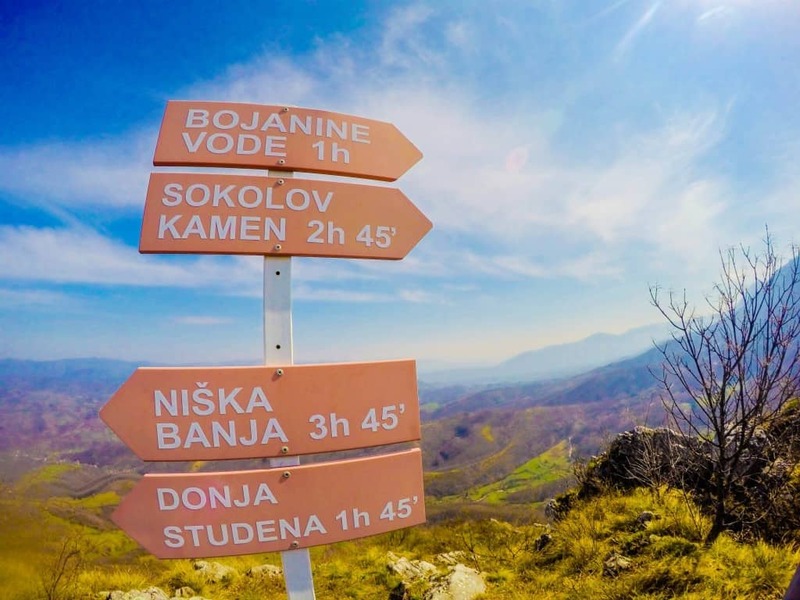 Nature lovers rejoice with regions such as the Serbian countryside, a part of the beautiful Balkans that remains relatively untouched. We love traveling to new areas that are difficult to reach and remain unknown to those besides the local tourists. We recently explored the countryside surrounding Niš, Serbia with A.C.E. Adventure and found beautiful landscapes filled with delicious food, wine, and adventure. We met the owner and founder of A.C.E. Adventure, Miša, in Niš. Niš would act as our base for the next couple days while we set out to experience the Serbian countryside. A.C.E. 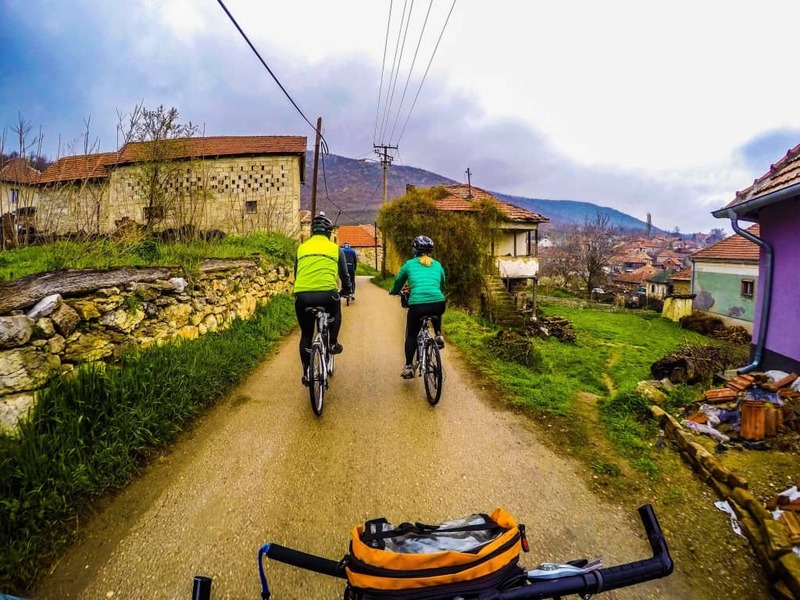 Adventures is a tour company that specializes in cycling and trekking tours throughout the Serbia, Montenegro, Croatia, Macedonia, and Bosnia & Herzegovina. So, who better than them to show us around than true locals. Even though it was the off-season they set out to give us two great days of cycling and hiking in the area. So, what was our day like? Cycling, cycling, food, and more cycling. Cycling is something that A.C.E. Adventures specializes in. We started the day off with a morning coffee before heading to get our bikes and ride right out of town. It was late March so we naturally had some rain early on, but pressed on to eventually earn a beautiful sunny day. Our first stop on the 47 km route was the monument to Battle of Čegar, a memorial to the first Serbian uprising against the Ottoman Empire in 1809. The memorial stands on the battlefield of what led to the gruesome and now infamous Skull Tower. 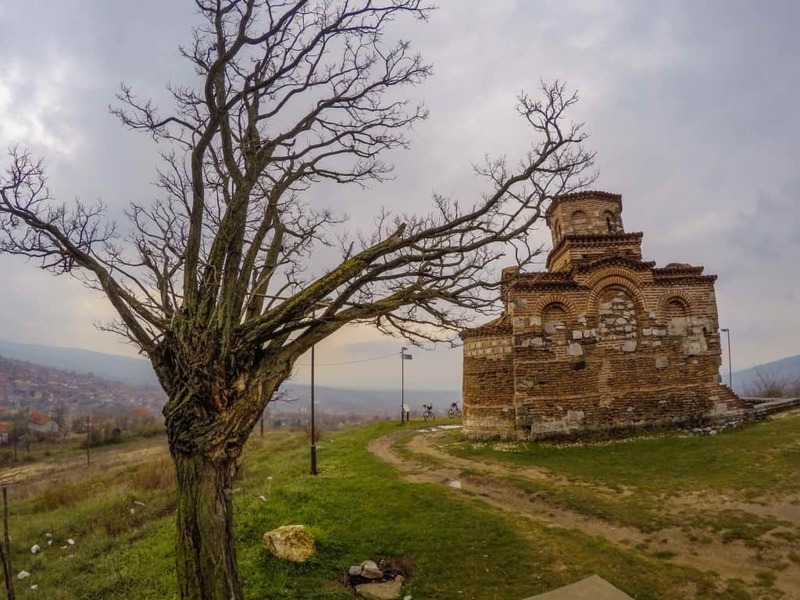 The next leg of our ride brought us to one of the oldest churches in the region that sat atop a hill overlooking the village of Gornji Matejevac. The church dating back to the 12th century was completely undiscovered except for the occasional local tourist looking for something new in the area. This site was one we were afforded the ability to visit because of our tour. We come to find through our travels that tours often help you reach destinations that are relatively off the map, as a foreigner we would have never discovered these back paths with our bikes. The next hour was spent winding through the villages of the Serbian countryside. We passed through many quaint towns where an abundance of the homes are still built with mud, a very charming but practical feature. Cycling through the rolling hills was both relaxing and exhilarating. However, climbing some of the hills with a bicycle was no easy feat. Nevertheless, cycling through these rural areas made for a culturally interesting and exciting day. We arrived in the village of Malča to have lunch at a regional winery. 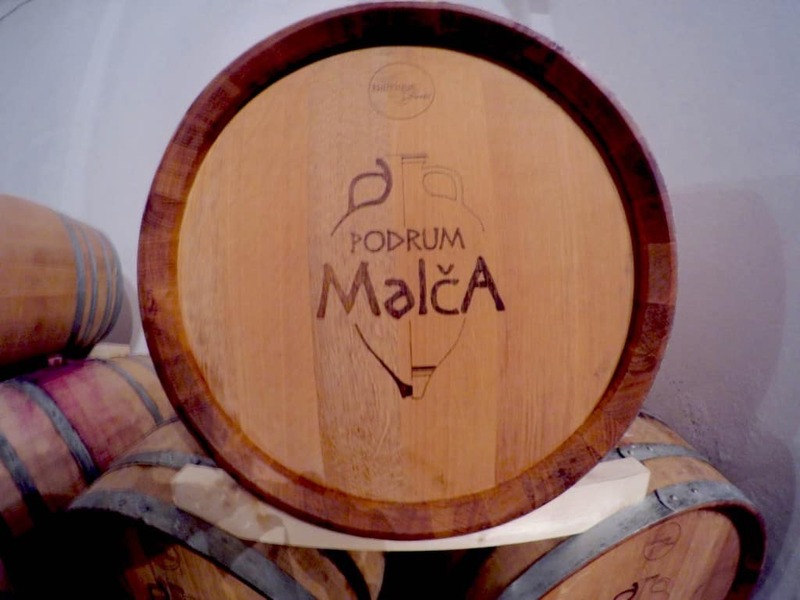 The vineyard, Podrum Malča, specializes in the history of wine production in the region and allows for visitors to sample wines produced in four distinct ways. After a tour of the vineyard presenting the various ways they can produce red, rose, and white wine we sat down to a meal in their adjoining restaurant. It was the perfect Serbian meal to fuel our active day. Shopska salad, stuffed peppers, grilled meats, and of course wine was all laid on the table for us to feast. After a little digestion it was time to continue our journey under sunny skies on towards our last stop. We may have mounted our bikes a little happier than before! Our last stop for the day was in the thermal town of Niska Banja, now a part of Niš, for an afternoon frappe. The town sat at the bottom of a small ridge which the local paragliding club would take off from. With the warm spring weather we had some great frappes, a popular summer drink in all the Balkans, as well as a favorite of ours that we’ve shared before. We biked a total of 47km and climbed an ascent of 1000m, a great day of cycling. After spending a month not being very active in Belgrade, this suited us very well. However, A.C.E. Adventures caters to all levels of riders with some tours a bit easier and others that extend for much longer distances and greater elevation changes. After a great nights sleep, we set out for the second day of adventure in the beautiful Serbian Countryside and the rich Suva Planina mountain range (english translation to “dry mountain”). Although the major cities in Serbia are relatively flat it’s pretty much impossible to go anywhere in the Balkans and not run into mountains. Niš was no exception and we had easy access from the city to a great hike up into the Dry Mountains. It was a short drive out of the city to the villages we cycled through the day before. Here we ventured off and onto more adventurous roads before parking along the roadside and making our way out onto trails maintained and marked by the dedicated local hiking enthusiasts. 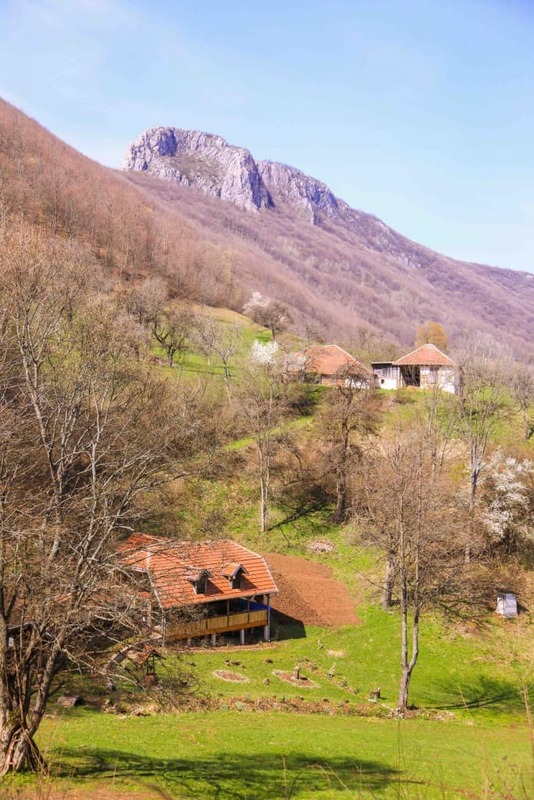 The Suva Planina mountain is abundant in a wide range of flora and fauna and as spring broke in the mountains we were greeted with fresh bloomed flowers. The cool spring weather kept us comfortable while we hiked up to the mountain ridge. We found ourselves wishing we had more time as the trail along the ridge line stretched to a number of peaks in the area and would make for more great multiway hikes. 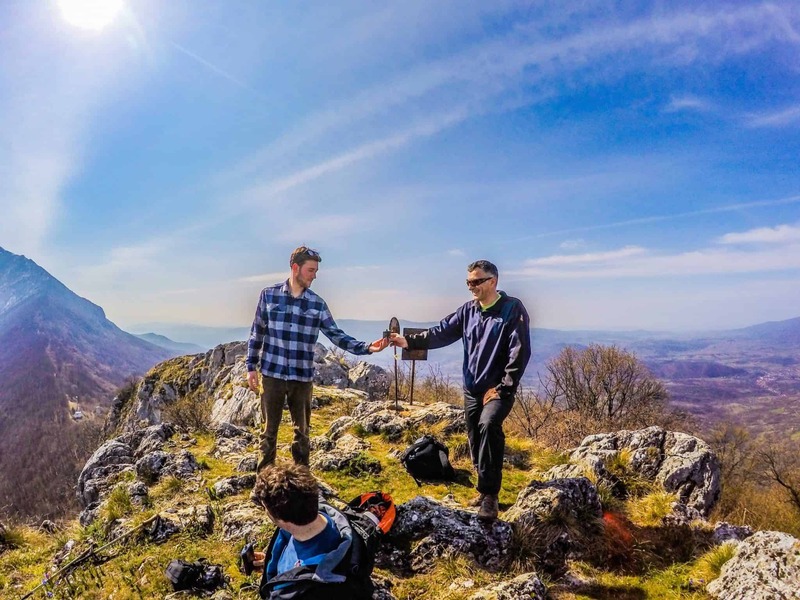 After a short but steep climb up to the peak of Mosor Mountain from the ridge we celebrated with a drink of the famous Balkan spirit, Rakija. Our hosts and guides, Miša and Zoran. After our photo-op we made our way down from the mountain into the quaint landscapes below. The Serbian countryside is filled with rolling hills, babbling brooks, cottages, and signature piles of hay. It was a spectacular day and we were not disappointed by any means when it came to the beauty of the Serbia. How can anyone complain about a region as beautiful as this? Naturally after a short climb up the mountain we had worked up a serious appetite. Thankfully there was a traditional Kafana in sight. Kafana’s serve up seriously good Balkan food and it’s where Serbs, Croats, and Slovenes belly up to the bar and eat. Trust us, just like the Balkans you will fall in love with the Kafana experience. After a filling meal it was time for us to say goodbye and prepare to move on to Skopje, our next stop on our Balkan tour. 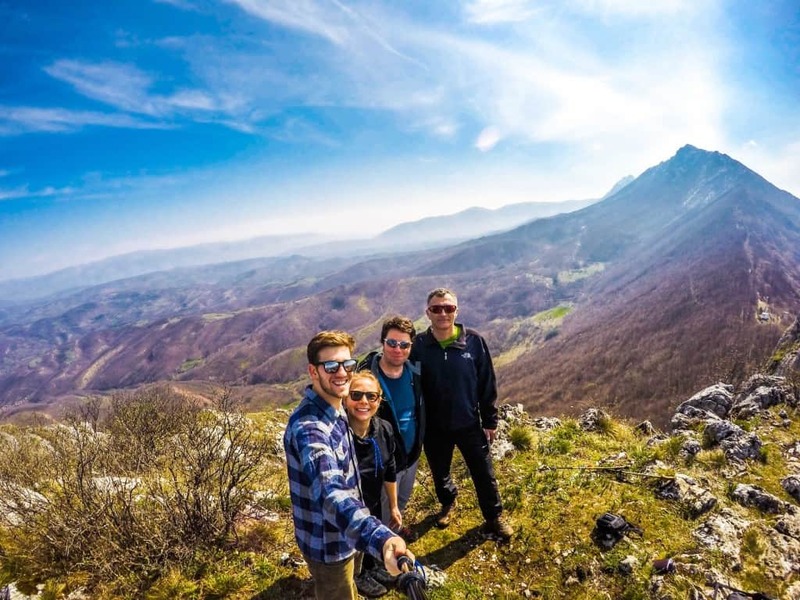 Our time spent with A.C.E Adventure and the surrounding areas of Niš were truly a highpoint on our tour of the Serbia and we can not wait to explore more of this beautiful region. A little more about the company. A.C.E. 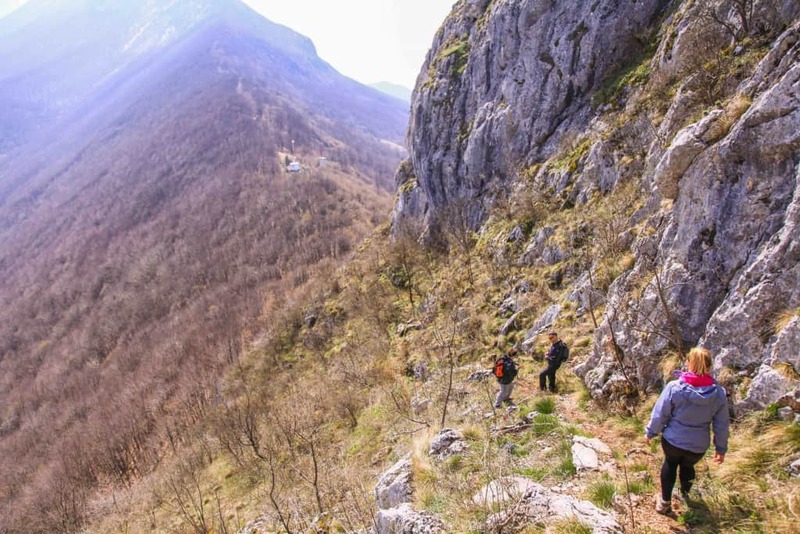 Adventure offers tours throughout the Balkans with skilled guides that carefully plan all logistics. You can always tell when people have a passion for what they do, and it shows in their work. We really felt the passion with these guys and had a memorable experience. 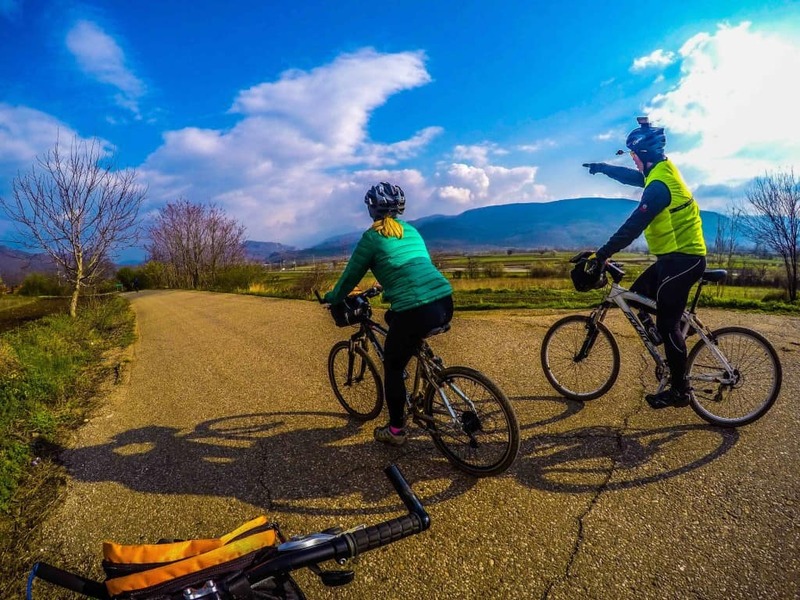 With various tours like trekking, gourmand, and cycling ranging from 2-day self guided tours to 15 days around the Balkan countries, all guests will be sure to feel right at home.